I made a visit to my favourate place today, but met with a major disappointment. 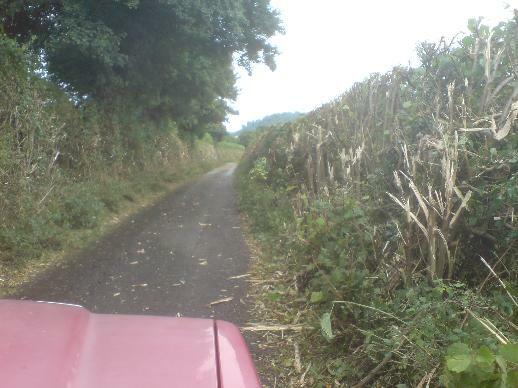 Someone had decided that the hedgerows alongside some of the single-track roads were overgrown, and took the modern tractor mounted gear to it. This was not the worst part – the road was relatively clear of debris here, elsewhere there were still branches, leaves, and loads of hay for some reason strewen across the road. This hadn’t been done today, either, so it’s not a case that someone hadn’t yet got to clear up – they’ve just left it like this. I hoped there wasn’t broken metal mixed in with all the debris to give me a flat tyre. Now I know the hedgerows have to be kept in order, else they’d block the road, but it seems to me the wrong time of year and very viscous cutters were applied here. One reason for the drive out was to see if the blackberries in the hedgerows were starting to ripen – I didn’t even stop to search.